June 15, 2007, L. G. Crabo. 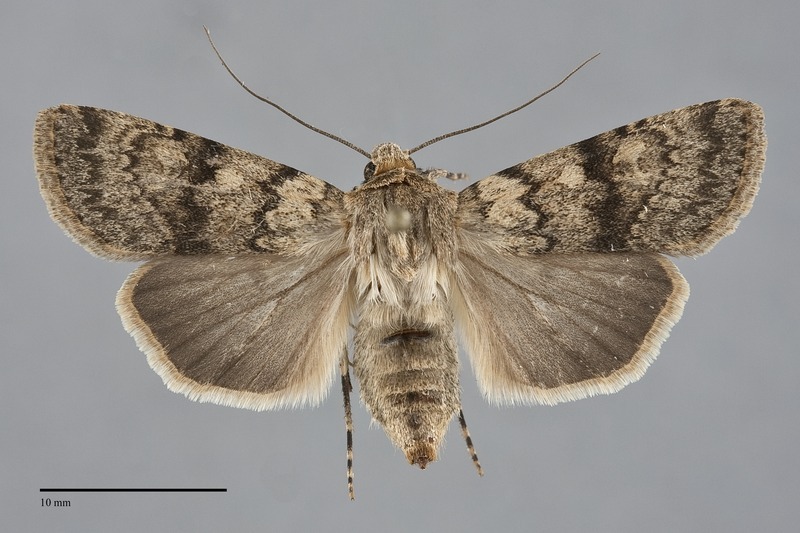 Euxoa setonia is a medium sized Euxoa (FW length 15–18 mm) with a suffused tan forewing with a thick black median line and pale filling of the orbicular and reniform spots that occurs in forests and steppe habitats during the early summer. The ground color varies from light tan to slightly yellowish brown, typically heavily suffused with darker scales to produce a powdery appearance. The dominant dark mark is a thick median line but the terminal and distal subterminal areas are also darker gray. The basal and antemedial lines are similar, dark gray, double with components of unequal strength filled with a slightly lighter shade of the ground color. The antemedial line is darkest adjacent to the median area, slightly irregular and slanted slightly toward the outer margin. The median line is dark gray to black, prominent, moderately diffuse and variable in width from narrow to very wide, slightly angled below the reniform spot where there is a slight defect in the medial edge. The postmedial line is dark, toothed on the veins, usually double with a light gray outer component, drawn basad on the costa, smoothly convex around the reniform spot, and angled slightly toward the base below the level of the cell. The subterminal line is pale tan, yellowish, or orange-tan, varying from absent to irregular with a moderate W-mark on veins M3 and CuA1. It is preceded by a dark gray shade, strongest on the costa. The terminal line is dark gray, thin or a series of spots. The fringe is similar to the terminal area. The orbicular and reniform spots lack outlines and are filled with a pale shade of the ground or slightly orange-tinted tan. The orbicular spot is oval, fairly small. The reniform spot is kidney-shaped, moderate-sized but less conspicuous than the orbicular spot. No claviform spot is present. The hindwing is brown-gray with slighly darker gray margin, veins, discal spot, and terminal line. The hindwing fringe is white with a tan base. The head and thorax match the forewing color and lack dark marks. A frontal tubercle is present. The male antenna is biserrate with long fasciculae. Euxoa setonia is a member of the subgenus Euxoa. This species can usually be recognized by its summer flight, gray-tan color, very prominent dark median line, and pale-filled spots without dark outlines. 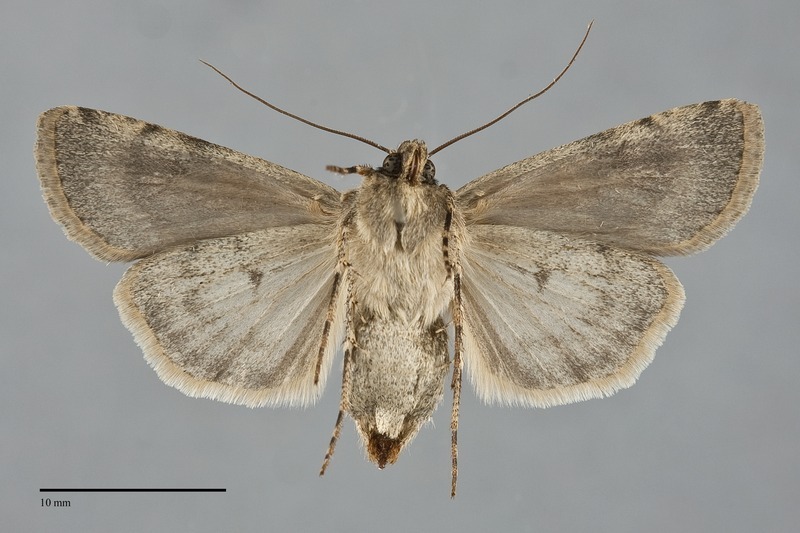 It is most similar to Euxoa pallidimacula, a rare species that flies is dry habitats. These species differ in color, with E. setonia being darker. Structurally, the shapes of the male saccular extensions of these species differ. This can be observed under magnification after brushing the scales from the tip of the abdomen. Those of E. setonia bend slightly away from the distal valves (directed ventrad) while those of E. pallidimacula are straight and appear parallel to the valve. Euxoa comosa, a common species that flies with E. setonia at several locations, differs from it in having a less prominent median line and by having forewing spots that are filled with the ground color or darker scales. Euxoa annulipes is similar to E. setonia in that the median line is the darkest forewing marking, but it is whitish gray in color rather than tan. Its markings are crisper and more contrasting than those of E. setonia, and the concave segment of its mid-median line is more conspicuous. Euxoa simulata is similar to E. setonia in color and pattern, but it has dark outlines of its forewing spots that E. setonia lacks. The type locality of Euxoa setonia McDunnough is Seton Lake, British Columbia. This species is widely distributed throughout the Rocky Mountain region in dry, open coniferous or quaking aspen forests. In the Pacific Northwest, it is usually uncommon in mid-elevation ponderosa pine forests or in dry open mixed coniferous forests of pine and fir. It has also been found in open sagebrush steppe at some localities, but is rare at these lower elevations. Euxoa setonia is found east of the Coast and Cascade Ranges south of southern British Columbia. The range of this species includes southern Alberta next to the Pacific Northwest. The distribution extends south to Arizona and New Mexico, and there is a disjunct population in the Black Hills of South Dakota and Wyoming (Lafontaine 1987). Euxoa setonia flies relatively early in the season, beginning as early as mid-May. It has been collected until early August in our region. It is nocturnal and comes to lights.